So we’ve just got over a day to go until the wonders of Android 4.0 ‘Ice Cream Sandwich’ are revealed to us. Knowing that something this big is coming, builds anticipation, which we need to satisfy, somehow. Well the guys over at Android Police have unearthed a number of icons showing off various image editing tools and photo effects. It has been rumored in the past that Google is working on a photo editor for the Android Gallery and the assumption here is that the editor might be launched as part of Android 4.0. 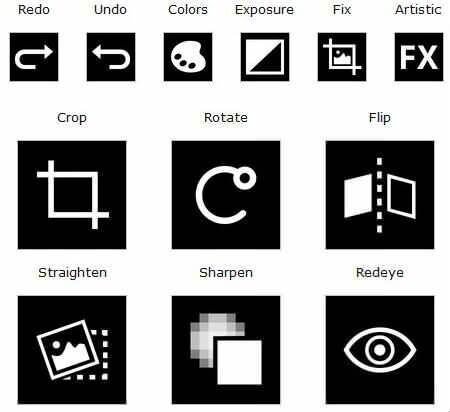 The icons, which you can see above, include tools like crop, rotate, straighten and sharpen, exposure adjustment and even artistic effects. From the leaked icons, there seem to be 19 different image effects, like fisheye, sepia etc. We’ve been clamoring for an easy way to fix and adjust images within the gallery, so this would be great news. Hopefully, Android 4.0 will bring a lot more exciting new features. Now see, by the time you’ve come to the end of the article, you are so much nearer to the actual launch!